The below comes from the words from mothers and fathers who came to receive water from the Fukushima Water of Life Project. 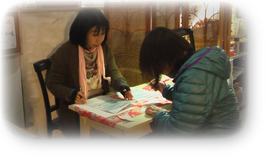 Please turn your ears to the words of the mothers in Fukushima. ・I wonder how many Japanese people can truly understand our situation in Fukushima. Every　day, we measure the insides and outsides of our houses with a dosimeter. As parents who have no choice but to live in Koriyama, our only focus is to “secure the safety of our children.” They can’t play outside, and we can’t let them play outside, so on weekends, we must take them out of the prefecture or to South Aizu City just to play. In no small measure is our strength declining. Eating being daily activity, we must be cautious about the water we use for that – even the most minor things like water and vegetables… These are small things but when all added up, I hope to protect the health of the children. ・My worry is that when these children grow up, they will be labeled as “children of Fukushima.” Water was a daily need that I would buy. You helped me. Thank you. ・I was worried every day for our children when such a thing happened in their growing period. I have somehow been able to live through all this through your support. I will get through this so that someday I too can return this favor to you. Thank you so much. ・Thank you always. As knowledge about Fukushima and people’s concern for Fukushima becomes less, I am grateful for your aid in providing water for many children. With ease of mind, I can give my children water and good meals. Thank you very much. ・Thank you. After a year and half, the amount of radioactivity has not gone down. Yet the news about the nuclear plant accident seems to be less and less. It’s easy to forget about the dangers of radioactivity, so the fact that I can drink safe water without worry, I am truly grateful. When my 2 children grow up to be healthy, I think that what they will think of is the people like you who have helped with this kind of work. ・To all of you at the Water of Life project, thank you. My child has turned 1. I was always buying water, but the younger my child was, the more I would worry about the radiation in it. I hope that you are able to continue your work hereafter. ・My child was born right around the disaster, and in all the worry, I was brought peace through this water distribution. Along with receiving baby food, I was also so thankful for the water that was given. ・In our home, we have 3 children, and another one on the way. They are all small children so we have been helped tremendously. I can’t thank you enough. Thank you very much. ・I am the father of a 3 year old and a 6 month old. Since after the disaster, I’ve never been more cautious about the water. To receive water like this for free, I am thankful from my heart. I would like to share about this project to the most important of my friends. 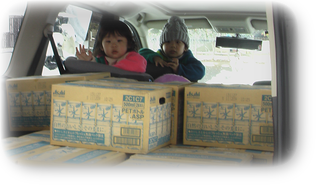 ・The children of Fukushima are living very risky lives. I ask that you continue to support us. This is my first time using your services. I live a worried life every day when I think about the radiation leakage in our daily food, water, air, dirt, etc., I can’t help but to wonder about the health of these children 10, 20 years down the road. I also can’t believe everything that the government says. I am so thankful to receive free water here today. I will definitely spread the word around Fukushima. Thank you. ・My child drinks breast milk so I was sure that it was safe to be using faucet water. But I began to worry. When I would go shopping, I would wonder if I should buy water or not. Now, that stress is gone and I feel safe being able to use this water every day, even for cooking. Thank you. ・Today is the first time I’ve heard about this service. When the disaster happened I was pregnant and also had a 1 year old. I was used to drinking well water in the country, and because I had to escape, I now can’t drink the water from my house. For someone who has never had to buy water before, I never thought I’d have to buy that along with clothing for my children. I learned that water is the number one most important thing, and I am so happy to be able to drink safe water. ・Thank you for always providing for us. I wanted my 2 year old grandchild, who could not even go outside, to be safe from the radioactive effect, so us grandparents are doing our best. We hope that you continue your services. ・I am getting my child’s milk from Milton. Thank you so much. ・Thank you so much. Just knowing that there are people supporting us strengthens my heart. ・Thank you for always allowing us to use your service. I just had my second child, and I also receive water for myself. I am so thankful for that. I hope you can continue this service for a longer time. ・My older sister just had her 3rd child, and I hope to be pregnant someday. So when I think about that, I am deeply grateful. ・As always, thank you. I am so thankful for all your strength. I feel safe using the water you provide. Thank you to everyone who labors for every distribution. I’ve said “thank you” many times, but it’s not enough! ・This is my first time using your service. I got to talk to some people here, and I’ve noticed that you have built relationships. I’m not sure if this was caused by the radiation, but last March my son had surgery on the adenoid of his nose. It is a condition where when the lymph system tries to protect the body, it swells up. As a mother, I can only think that it was trying to protect his body from radiation. Even half a year after the surgery, it still has not recovered. In August, we participated in a recuperation project in Hokkaido. In the 10 days that we were away from Fukushima, his condition went away.The water we have been receiving has been very helpful. Until now I was stocking up on water when the grocery store would have specials on water, but still spending more than 5000 yen a month. 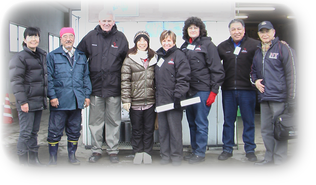 Your staff has done such a good job, even in the cold weather. Children would play together. I was so happy to see that. ・Today is my second time receiving water. It is very very helpful. Ever since March 11th, our worries no longer revolve around having to buy new rain gutters, but how many micro Sieverts of radiation there is in the air. Our lives went from feeling safe to feeling scary. Despite the fact that we didn’t have money, we moved. Life was hard, but I was still buying water. Until this child grows up, it is our responsibility to protect him. A lot of things, a lot of thoughts, there is not enough space in this notebook to write all of them. But.. but to express my gratitude for this water, words cannot express. Thank you very much. ・I heard about your service in June. I feel supported just knowing that there are other people that think seriously about our children’s’ safety. I’m sure it is a lot of work gathering all this water, but I can’t imagine how many people are helped through this work. I hope that this service can continue. Thank you, always. ・Since I experienced the disaster, I’ve realize I had taken for granted the normal life I used to have. Water with good intentions… this distribution I am thankful for. Even now we cannot drink the water from our faucets. I hope that you can continue this for the sake of my son, and that it would spread. ・This water is truly necessary for children, it truly is the water of life. I am very very thankful that I can receive water that is safe to use. I begin to wither as I think about how long this lifestyle will last, but when I am reminded that there are people here to help, I borrow that strength and I think I can do it. All us mothers in Fukushima want is for our children to grow up healthy. ・Every time I see the piles of cardboard boxes with water, I lower my head and my heart is full. Every bottle of water I receive, we savor at home every day. This thankfulness I have, I will never forget. My heart is strengthened. Thank you. ・I am very very thankful. More than anything, I am thankful for this. Please continue this. If there is anything I can do help, I want to. – A mother of a 5, 9, and 11 year old. ・In my home, I have grandchildren, 1 and 3 years old. Since March 11th, we have been very cautious about the water we drink. I hope that I can continue to receive water for my grandchildren as they grow older. I have been helped so much. ・I am always worried about water and food. I don’t know what to believe. But it helps to receive this water. ・Thank you for your hard work on this rainy day. I am glad that my children get to drink safe water. The system here has gotten very efficient with the telephone reservations system. You have done a very good job. ・Living life in radiation is more mentally painful than I thought. I am worried about what sort of bodily conditions my children will face. In order to lessen the likeliness of that, I think it is good to feed them as much good things as possible. I am so happy to receive your water. Thank you from my heart. ・Water is very important, so this service has been very helpful. This problem with radiation could be unstable for decades, and I’ve been very worried. But, thank you. ・I have 5 children, so this has been extremely helpful. ・While carrying my small child to the grocery store, I was buying water. This has helped me financially. Thank you. ・At the moment, I am not thinking about evacuating. With reasons like my job, finances… I’m sure the best thing to do is to evacuate, but I have decided to go on living here. So, anything that I can do, I do it all for my children. One of those things is to be cautious about the food and water I feed them so that in the future, there is nothing me or my children will regret. I want to try my best so that my children don’t feel disabled because we didn’t evacuate. To eat is to live. 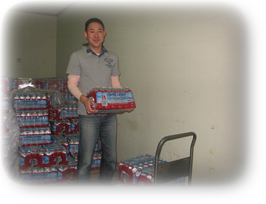 Please continue to provide water for the children of Fukushima. ・I wanted to stay with my family, so going to another place besides Koriyama is something I did not think about. But the current situation is that we are living in hardship every day. Since the disaster, I was buying all our water. I am very happy to receive this water from you. ・I am about to give birth to my child, so in all the worries I face, I am so happy to receive this kind of aid. ・Since I’ve started receiving water, the smiles at the dinner table have increased. I am full of feelings of thanks. ・I have to intention of leaving Koriyama where I grew up. But of course I have worries. I am very thankful for the support of water. I hope you can continue your work for the sake of my children. ・Although they may say that the radiation levels are going down, I cannot confirm the safety. It is so good to know that there is safe water to drink. To meet this kind of service makes me very happy. ・I didn’t know that there was a place like this. It helped me out a lot. I know other people that have children, so I would like to tell them about this too.